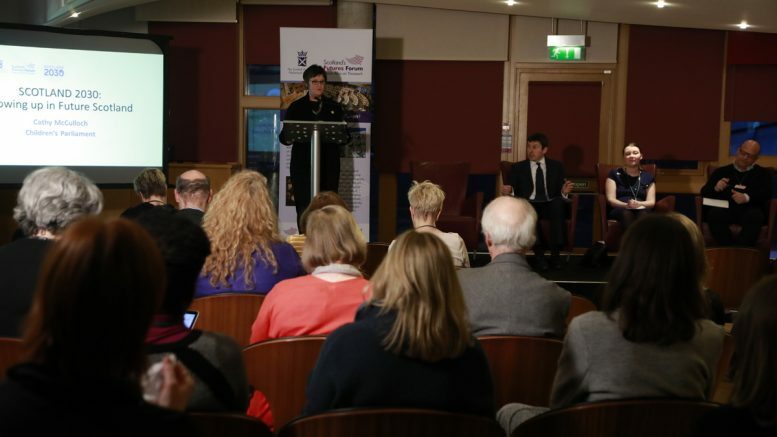 In 2018, Scotland’s Futures Forum’s Scotland 2030 Programme is looking at different stages of life in future Scotland. The first event in the series considered what growing up in Scotland in 2030 could and should be like. The Futures Forum heard from Cathy McCulloch, co-director of the Children’s Parliament, Madeleine Brown, Member of the Scottish Youth Parliament, and Marc Lambert, chief executive of the Scottish Book Trust, on what life is like for children and young people in Scotland today and on how it could and should change given other developments expected by 2030. The discussion was chaired by the Presiding Officer as chair of the Futures Forum board of directors. Through 20 years of working at the Children’s Parliament, Cathy was uniquely placed to report on how children view Scotland. Generally, children feel that Scotland is doing well in how it delivers services to children, with most children reporting that they feel loved and cared for, while many are also excited by Scotland’s landscape and history. However, the picture is more complex for many of the children the Children’s Parliament work with. Madeline was able to share the interim results of an on-line Scottish Youth Parliament consultation on the best thing about growing up in Scotland now and what could be changed in the future. Common responses to the question on the best thing included: dedicated youth work, which was seen as playing an important role in improving young people’s lives; free education, especially free higher education; a strong sense of identity as a country; and access to a beautiful landscape with opportunities to be in nature. Marc opened his presentation with some stark facts on poverty, pointing out that 25% of Scottish children are currently living in poverty, a figure that is predicted to rise to one in three children by 2020. Marc went on to highlight how the effects of poverty start early and have long lasting impacts. Children from the most disadvantaged backgrounds are twice as likely to experience a speech, language or communication concern at 27 to 30 months, while the vocabulary scores of children aged five are associated with their literacy as adults aged 34.